Sam is a geek movie-buff with a ragtag group of loser friends who have been taking abuse from the popular kids for years. But when the super-cool Camilla moves to town, she surprises everyone by choosing to spend time with Sam's group. Suddenly they go from geek to chic, and find that not everything boils down to us and them. With their social lives in flux, Sam and Camilla spend more and more time together. They become the best of friends, and Sam finds that he's happier and more comfortable in his own skin than ever before. But eventually Sam must admit to himself that he's fallen in love. If he confesses his true feelings to Camilla, will everything change again? Aussies supposedly write some of the best books out there. Unfortunately, they choose not to share many of them. Okay, maybe it's that American publishers choose not to purchase them for years on end, but, either way, I end up missing on quite a lot. This little Aussie gem became available in the US, and when I had a chance at a review copy, I snagged it. Be forewarned that this book is not science fiction. That's lesson number one. 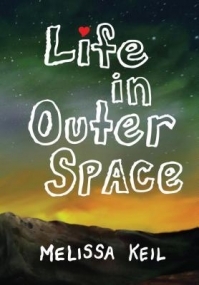 Life in Outer Space is an adorable, nerdy contemporary novel about first love, finding your passion, and pop culture references. For much of the novel, I was enjoying it but concerned that Life in Outer Space was headed for manic pixie territory. Camilla arrives in Sam's school and completely changes his life. She's beautiful, quirky and somewhat mysterious, the daughter of a famous music critic. She's lived all over the world and dresses in weird clothes that only she could ever pull off. The amazing Camilla transcends social group, immediately accepted by the popular kids, but able to choose to spend time with the nerds without facing any repercussions. Girl is magical, basically. Thankfully, there's more to Camilla than that. Sam really gets to know Camilla, and the two have oodles in common, and, perhaps more importantly, they're open to learning about the interests they don't share. He educates her on horror films and she teaches him a bit about music. They're supportive of one another and admittedly adorable. She doesn't exist just to make him better; they help each other improve. Other than a point I'll note later, I definitely shipped this so much. I adored the nerdy bits about cinema, from the horror movie marathons to Sam's absurdly terrible sounding attempted screenplays. Throughout the novel, various jokes about horror movie cliches are woven. For example, at a party Sam thinks a particular girl would be the first to die, which is admittedly kind of terrible but also hilarious. Though I don't know much about horror movies, since I can't watch them, I know I missed out on some awesome stuff there, but it was still great. There are also numerous science fiction and 80s movie references, which are more my speed. The characters are pretty fantastic. Sam's group of friends, Mike, Adrian and Allison, banded together because none of them fit in and formed this awesomely nerdy haven. They eat lunch in a teacher's office because they feel unsafe in the cafeteria due to bullying, but they get to watch movies while they eat, which is win. I'm an especially large fan of Mike and the LGBT subplot, and the fact that, unlike so many gay best friends in YA, he actually gets a resolution to his plot line. My only reservation about Life in Outer Space is Sam. He freaking rivals Hamlet for his inability to make the decision on whether to act on something. Basically, you will spend the whole book trying to make him help his friend Mike or tell Camilla how he feels. Of course, to tell Camilla how he feels, he'd have to know how he felt and he's one of the least self-aware people that ever existed. I get that people are like that sometimes, but Sam still felt absurdly hesitant to me. Given how close that group of friends is, SOMEONE should have said something without it taking so freaking long. Plus, if things happened quicker, the ending wouldn't be quite so incredibly sappy. Oh, and also the fact that all of the nerds clean up and are rather attractive at the end felt a bit too She's All That. Life in Outer Space is a nerd's dream of a book. Though it got a bit too idealistically fluffy for me at times, it was still a delight to read and gave me many happy feels and made me laugh, so it's one I'll definitely be recommending.